It’s almost time to start growing vegetables in the outdoor garden plot. In the meantime, I have come across an easier way to grow veggies year-round, with almost no effort at all. At least for green onions and romaine lettuce. After buying them from the store and eating them except for their bases, just plop the remnants in water. That’s it! They will start growing like magic from there. In the photo above, I put green onions in dirt in a nice flower pot that my ol’ climbing buddy Kristina and me bought at The Tree Center ages ago. But supposedly, they shouldn’t need dirt to grow. Water is good enough—just like for the romaine heart of lettuce shown in the photo above. I will test that out soon once I obtain a nice slender vase. 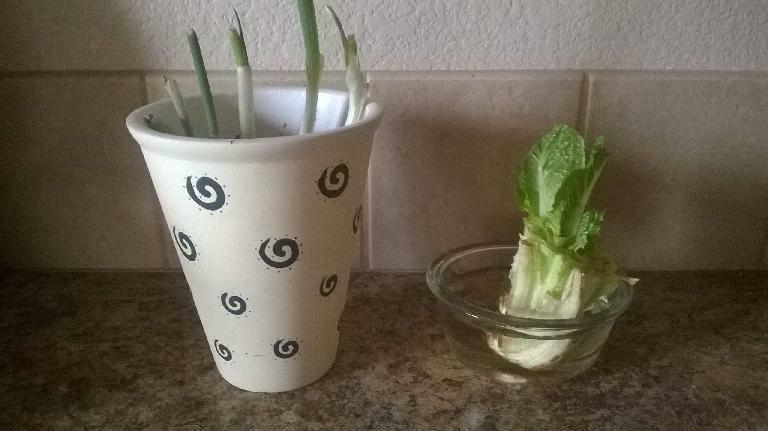 It took about two weeks for the romaine lettuce to reach the height shown in the photo. Green onions seem to grow almost an inch a day. I wonder what other vegetables can be regrown like this? Pretty soon I will have a whole kitchen garden. Wow, garlic greens can grow 8-10″? I had no idea! That’s like green onions. I’ll have to try planting garlic cloves even though it looks like dirt is required for the greens to grow. Thanks for the tip, Raquel!